Chicken noodle soup to be exact. With just about everyone getting sick and the cold weather setting in soup was the perfect thing to make on this chilly Sunday. I have previously made soup in class so it wasn’t so intimidating to take on this recipe, but my major concern was the chicken flaking up in the stock and becoming little bits instead of nice square chunks. To begin I decided to take on the vegetable version since just chicken and noodles seemed a bit boring and too much like cheap Campbell’s cans. Also, I didn’t need six litres and reduced the recipe down just to two, which made the grocery shopping a little easier to deal with. The recipe called for the carrots and celery to be simmered in the stock till tender, so I decided to give it a nice appearance. For the carrots I made thin slices then punched out floral shapes for a little flair. I realize this reduces the yield of a carrot quite a bit, but I suppose if you’re visiting a nice restaurant they may do the same to make their recipe stand out. As for the celery I just small diced, too many odd shapes would make the batch look weird. So while those simmered I boiled the noodles. Again I changed it a little. The recipes said egg noodle but I like bow ties. Bow ties are cool. Additionally another worry was the noodles being too soggy, so to stop this from happening I only boiled the batch for five minutes, just slightly soft with a noticeable crunch. As the noodles cooled under cold water and the vegetables simmered, I diced up 100 grams of chicken breast that had been cooked the previous night and chilled in the fridge. I was surprised how nice the pieces looked. A sharp blade and cold meat really does make it easier to get the shapes you want compared to warm meat. By now the vegetables were softened and the noodles were ready. So into the pot everything went. While everything returned to a simmer I quickly tidied up and tasted the batch, then made my husband taste it because I wasn’t sure my taste buds were completely back. Well they were and it tasted great. Having the noodles firm when they went in was great because by now they had further softened up but not to a mush, and the chicken remained in tidy pieces. 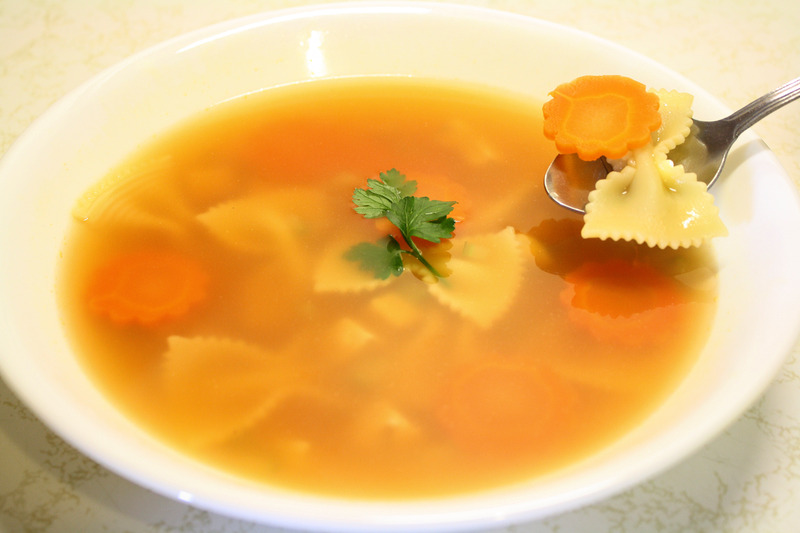 As you can see in the picture the two different shaped items (carrots and noodles) gave the bowl a nice decorative look while you can barely see the chicken and celery through the stock. Next time I may add a couple of more vegetable types like peas and onions, but the only thing I would definitely change is to have crackers at the ready. A few weeks ago we were set the task to come up with our own soup and salad recipes using set ingredients. With the internet and my cook books I came up with a couple of plates that I was proud of, but made mistakes with the soup that needed to be fixed. Not wanting to leave it though I decided this weekend to redo the recipe and fix my errors. 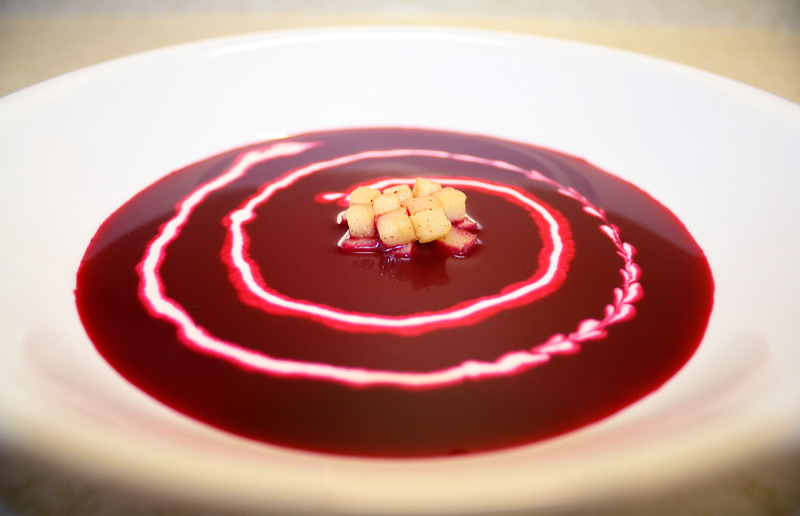 To start, the soup I previously made had to have beets, parsnips and apples in the recipe. There were other additional items I could add to the mixture but those three were set. After a few hours of cooking the vegetables and simmering it all in liquid, I had then pureed the mixture and set it up for presentation. The first thing I noticed is when I added cream to make a spiral it did not enter the liquid, more of sat on top. Quickly I washed out my bowl, tried again using a squeeze bottle to actually make a dug in spiral. When Chef (I have multiple chefs so it is not the same one every time I say chef) checked my soup he said it was too thick, and together we decided it had the consistency of apple sauce. Well today I decided to fix that mistake. Once again I roasted up my vegetables. A combination of onion, apple, parsnip and beets. As I let it simmer for the required half hour I began to carefully dice up pieces of apple into small squares which I then soaked in lemon juice so it wouldn’t brown right away. From there I tossed the apple cubes into a hot frying pan, adding pinches of sugar and cinnamon to sweeten it up and make it soft. When done I moved it to the fridge to cool down as I continued on with my soup. Now one thing I forgot is that we don’t have an immersion blender, or even a blender. So I attempted to use a masher, then a mixer. Afterwards I sifted it through a sieve and ended up with a beautiful bowl of thickened wine coloured soup. During the cooking process I had added a bit of sugar. I didn’t want it to be sweet like a dessert, but not as bland as how I found my previous attempt. The flavour I believe came out with a distinct beet taste but with a tang of sweetness. Additionally, when spoonfuls of the soup had a piece of apple it had a nice tart combination. What I find interesting about this soup is the lack of herbs. During the task we only had a few herbs offered and many of the recipes I found called for ones we didn’t have, so the dish actually completely relies on the flavours of the vegetables and sugar. To plate my soup I simply piled the cinnamon cubed apples in the centre, then spiraled the cream around starting from the outside. It is quite easy, and if I was to have something like this for a future restaurant I would probably have the server spiral the cream around once they served the customer, this way the cream wouldn’t wobble in the bowl and make a mess. While with the apples I would also have them already prepared and with each soup order I would have them just quickly tossed in a frying pan to warm up.